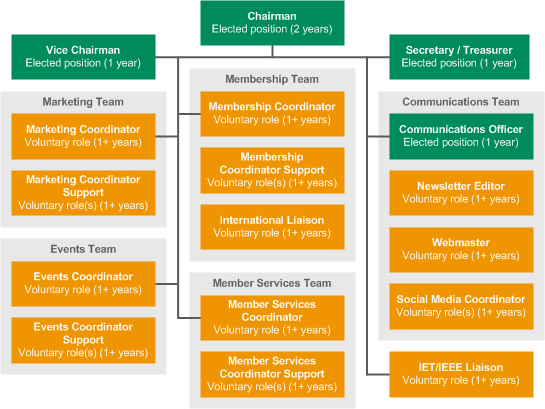 The NGN is run by a dedicated team of elected and volunteer members (please check the Vacancies page if you would like to get involved). The team meets 4-5 times a year at Steering Committee meetings, which are also open to any other NGN member who may be interested. Previous Chairs were Jonathan Halliday (2007-2009), Beatrice Chong (2009-2011), Aruna Gunatilake (2011-2013) and James King (2013-2015). Previous Vice Chairs were Maria Brucoli (2007-2009), Aruna Gunatilake (2009-2011), Angela Rotheram (2011-2012), James King (2012-2013), Tianning Xu (2013-2014), Stefie Cray (2014-2015), Supipi Weerasinghe (2015-2016). Previous Communications Officers were James King (2011-2012), Peter Roddis (2012-2013), Nathaniel Cowton (2013-2015), Tom Haslam (2015-2016). Nathaniel Cowton (WSP Parsons Brinckerhoff), Thomas Haslam (Uniper), Claudia Spellarossa (Mitsubishi Electric).